Carefully Cultivating the Best Puppies for You! 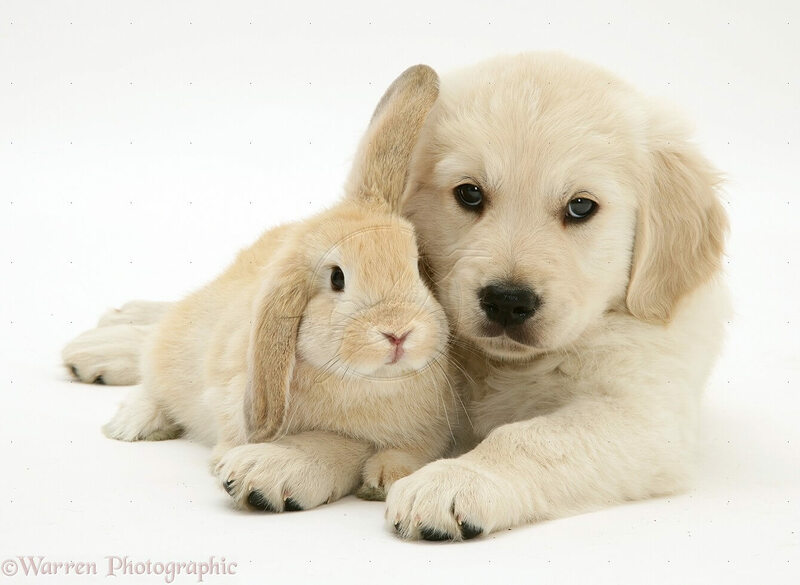 Here at GoldWynns, we put everything we have into breeding and raising the highest caliber English Cream Golden Retriever puppies for families and individuals to love! It is of utmost importance to us that your puppy lives a long, healthy life, bringing you companionship, joy, loyalty, and the capability to provide whatever it is you are looking for in a dog. That being said, we carefully cultivate our puppies to possess the greatest health, pedigree, traits, temperament, and soundness. 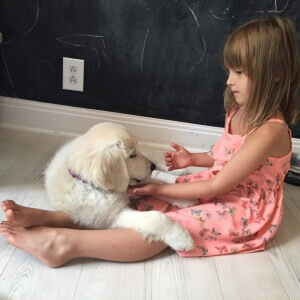 From day one, our puppies lives are full of love and attention, providing them with an all encompassing puppy program sure to grow them into the English Cream Golden Retriever you are looking for. Whether you are seeking a therapy dog, family companion, hunting dog, agility competitor, and/or show dog, we are confident that our dedicated, loving care and thorough puppy program will provide you with the puppy of your dreams! 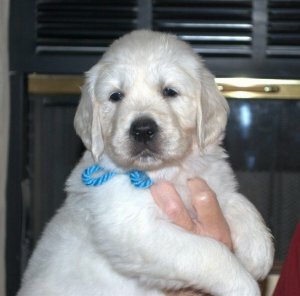 In order to breed and raise the best puppies we can, we give our Cream Golden Retrievers every advantage possible. We are so proud of our puppies and it is important to us to encourage and promote their healthy growth every step of the way. From day one, puppies in our program are given a high quality, well-balanced diet, top notch veterinary care, extensive socialization, and most importantly, lots of tender loving care! All of this careful nurturing helps us ensure that you are taking home the best pet you will ever have. Our commitment and promise to you is to uphold these values with every dog we raise, thus providing the highest quality care and the most exceptional White Retriever puppies you can find. Check out our numerous puppy families testimonials above. One of the most important factors to consider for raising a well-rounded puppy prepared to take on any challenge or lifestyle is socialization. Here at GoldWynns, we provide our English Cream Golden Retriever puppies with extensive socialization using the Bio Sensor Program, also know as Early Neurological Stimulation (Revised). This program was originally developed by the U.S. Military to train dogs in the canine program for superior performance. This track starts at just three days old, making sure to take advantage of the puppies’ sensitive period of rapid neurological growth and development, when they have the greatest learning capacity. The Bio Sensor program includes handling the puppies using five exercises: tactile stimulation, head held erect, head pointed down, supine position, and thermal stimulation. Enacting these handling techniques at such a young age gives our White Golden Retriever puppies a superior advantage. We also provide a puppy romper playroom for your puppy to experience new textures, sounds, toys to assist in the socialization process. Excellent health begins with a high-quality diet that meets all nutritional needs. From the beginning of their lives, we feed our puppies Life’s Abundance alongside with the Agility Formula, a holistic supplement formulated to support your puppy’s joints and overall health. We have dedicated extensive time and continued research to guarantee our puppies are receiving the best possible nutrition available. This undoubtedly aids in decreasing the likelihood of any future health problems and lengthening the lifespan of your English Golden Retriever. We are so confident in the healthy diet that we feed our puppies that we offer a five year health guarantee when you feed our recommended food and supplement program for the life of your golden! We encourage you to learn more about our dog food and compare! We are committed to making sure you are completely satisfied with the puppy you take home from us. Every one of our puppies comes with a one year health guarantee for inherited genetic diseases or crippling hip dysplasia. This, combined with the aforementioned five year health guarantee for puppies who remain on our recommended dietary program, is our way of showing you how much we believe in our English Golden Retriever puppies. That being said, diet and physical condition play a significant role in the development of joint dysplasia, so be sure to put forth effort to exercise your dog and prevent them from becoming overweight. Your puppy is set up for success from day one and we are confident that with the right diet and care, they will go on to live a long, healthy life. To honor the significance we place on pedigree, your puppy comes from American Kennel Club (AKC) registered parents and includes AKC limited registration papers available to you after your puppy is spayed/neutered. We put immense hard work and dedication into raising the best puppies possible for individuals and families and this papers stipulation helps to prevent unscrupulous activity in regards to breeding our puppies under different registries. That being said, we recommend waiting until at least one year of age to spay or neuter your puppy. This is a preventive measure, as there are some new studies suggesting that early spay/neuter may increase the likelihood of cancer. With the well being of the dogs in mind, our Cream Golden Retrievers are placed in approved, loving homes with AKC limited registration papers. You can fill out our puppy application here. In addition to exceptional care, proof of pedigree, and health guarantees, our English Cream Golden Retriever puppies come with one month of free insurance (included in your puppy packet) as protection for you and your pup. We offer this insurance through Trupanion Pet Insurance, providing medical coverage for your pet. We believe that Trupanion offers the best health coverage for the money. Pet insurance is a great way to protect yourself from the financial burden of veterinary care so you can ensure your pet is getting the best care possible! You absolutely have the choice of either continuing or canceling this service after the 30 days of free coverage we provide. 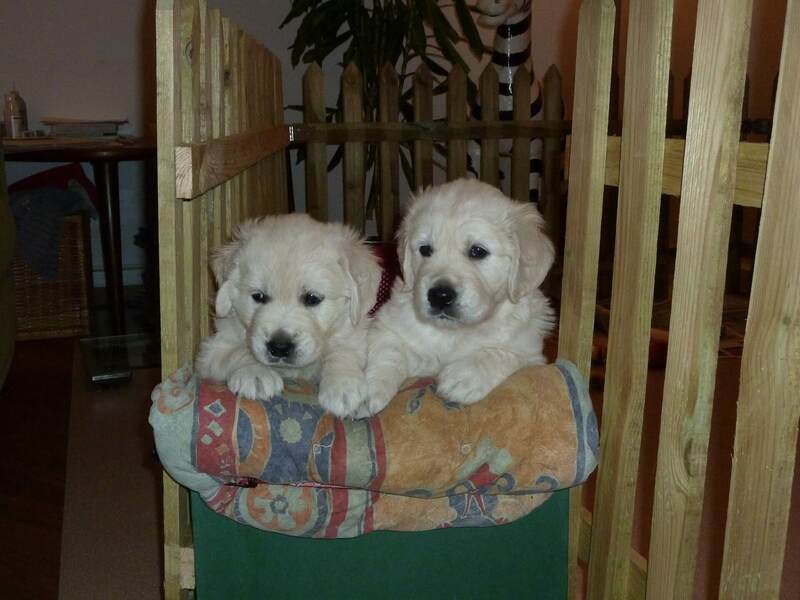 We hope you are as excited as we are about our English Cream Golden Retriever puppies! Know that the prospect of bringing home one of our puppies means a lifelong companion bred from healthy, Champion dogs given every advantage possible to promote long, healthy lives! 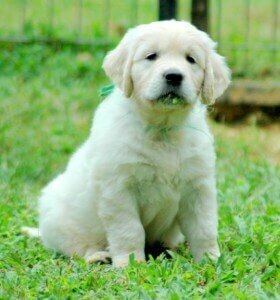 Furthermore, you will find the beautiful white coat, large strong head, and amazing temperament we all love about English Cream Golden Retrievers! If you are interested in reserving one of our puppies, you must first fill out our puppy application here. Reservations are accepted on a first come, first serve basis to qualified individuals/families only. We require a $500 deposit to hold your puppy until pick up. Reservations fill up quickly, so place your deposit early! Picks of the puppies are to be made at five to six weeks of age. We do our best to provide you with pictures/videos of the puppies each week so you can see how they are developing. At five to six weeks of age, we encourage you to come pick your puppy in person, but you are welcome to pick from the pictures and videos you receive. Your new family member is ready to come home with you at eight weeks of age! We hope to see you in person, but shipping is available to you when needed. Whether you are looking for a loyal companion, superior show dog, patient therapy animal, or expert agility or hunting dog, reserving one of our puppies is one of the biggest and best decisions you can make! 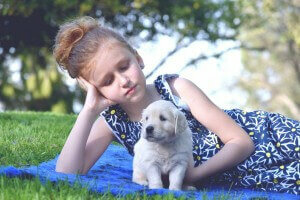 We offer lifetime support to you and your puppy. 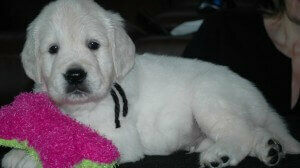 Contact us today to inquire about available English Cream Golden Retriever puppies!